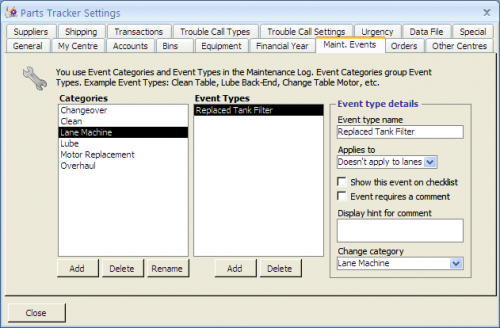 Maintenance events can be associated with a machine number, a pair of lanes, a piece of equipment, or nothing at all. Examples of associating an event with equipment could include ball returns, motors, pinball machines, appliances, lane machines, etc.Examples of associating an event with nothing at all could include checking emergency lighting, cleaning air vents, replacing car-park lighting, and other building maintenance – basically anything that you want to track that doesn’t associate with a machine, lane or specifically recorded piece of equipment (in the equipment list). 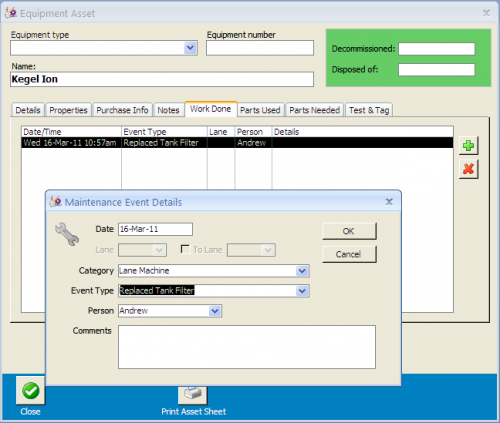 As of Parts Tracker v4 you can record details of equipment and track maintenance events against them (in addition to parts used, parts required, etc – see the new Equipment screen in the Facilities section). The special detail about this event type is that you select “Doesn’t apply to lanes” in the Applies to box on the right. This means you won’t have to select a lane number when creating such an event.